Don’t Forget the Driver is a new comedy for BBC Two, the first piece of writing for television from BAFTA winner Toby Jones and Obie Award winner Tim Crouch. 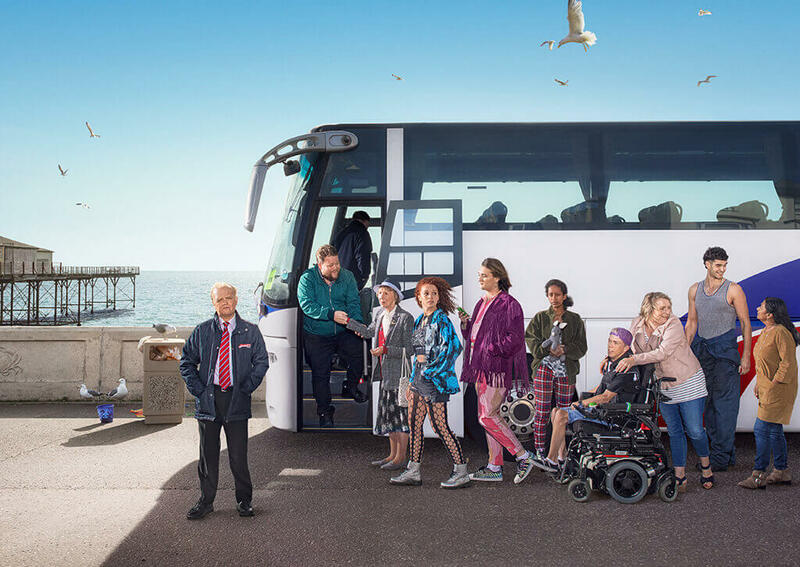 Set in the seaside town of Bognor Regis, Don’t Forget the Driver ‘observes the beauty and ugliness of life in small-town Britain,’ following a group of people struggling with their sense of identity and place in the world. The Bova Magiq used in the television show has been provided by Woods Travel of Bognor Regis and carries fictitious Bassetts Travel fleet names. Talking about the new series, Tim Crouch said: “I grew up in Bognor Regis but I live in Brighton – I haven’t strayed far from home. To the east of Brighton there’s a coach park on the seafront – I used to jog along past the coaches and I would see the drivers hanging out, washing their vehicles, reading the papers and chatting to each other. I was intrigued by what the narratives of those people would be. I started taking coach trips with a firm based in Bognor – writing notes, taking photos. That’s how it all began – we wanted to follow the life of a driver through the daytrips he takes. The first episode aired on BBC2 on Tuesday April 9 at 2200hrs and will also be available on the BBC iPlayer.